“Article in nature electronics: Thermoelectric devices become quicker, more reliably and suitable for integration in microchips. Thermoelectric materials can convert heat into electricity or, vice versa, can be used as environmentally friendly cooling elements. In many processes in everyday life and in industry, energy losses occur in form of waste heat, which can be converted by thermoelectric generators into electrical energy. This also provides an additional power source in these systems. Another particularly attractive application of thermoelectric materials is the cooling of microelectronic components, for example in processors or for thermal management in organ implants. For this purpose, thermoelectric generators must be suitable for integration into modern microelectronic systems. In addition, the manufacturing process must be compatible into the established processes of chip production. All this has proven challenging, so that a broad application of micro thermoelectric devices has not been realized so far. Now there is a promising new approach by researchers at the Leibniz Institute for Solid State and Materials Research Dresden (IFW). 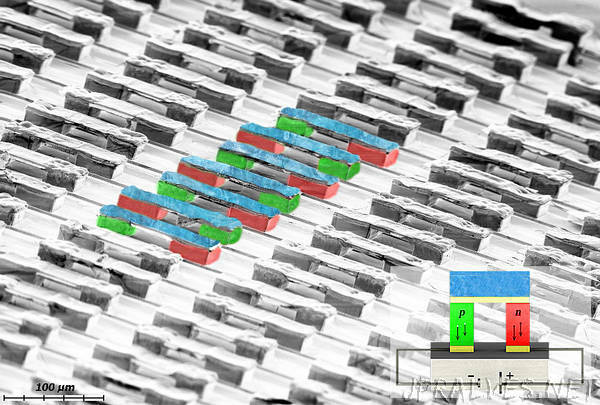 They introduced a crucial innovation in the deposition process of the thermoelectric bismuth tellurium compound. An additional gold electrolyte bath immediately after the layer deposition forms a protective gold layer on the thermoelectric elements. This interface significantly reduces the resistance between the thermoelectric material and the contact layer, which has a very positive effect on the efficiency and the functional stability in the long-term test. The micro-thermoelectric devices processed in this way offer a very fast cooling response times of only one millisecond and a high reliability of more than 10 million cycles and more than 30 days of stable cooling performance. The improvement of these figures represents a decisive step towards the broad application of thermoelectric components.